Temporarily out of stock. Please add your name and email to our waitlist and we will contact you when back in stock. 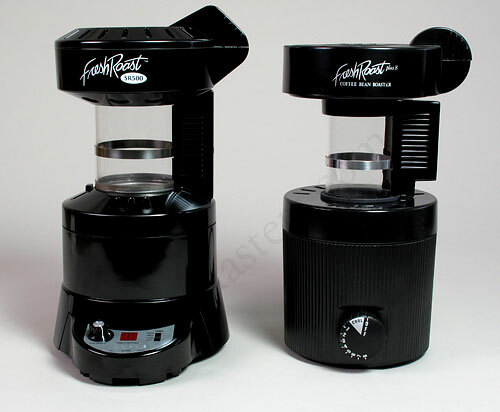 There are two redesigned models of the Fresh Roast, replacing the Plus 8 model that had been available for a number of years. The new models address issues that users have had with the previous model, one considered an entry level roaster. Both new models cost more than the predecessor, however, they remain quite reasonable and both have the same, larger capacity. Either model can roast coffee dark, desirable for those into that style, however, these roasters do not offer smoke suppression. If you roast dark expect to roast under an oven exhaust hood, near an open window or outdoors if the weather is warm enough to not reduce thermal efficiency. Roasting outside in the cold will negatively affect your roast. These roasters mark an appreciable upgrade from the single previous Plus 8 model. Build quality is sturdy and clean, operation is very quiet and controls are easy to read and understand. Of particular interest is that either roaster is capable of producing about twice the coffee as the Plus 8, now 4 scoops, each 43cc. This is equivalent to about 4.5 ounces or 130 grams of green coffee, enough to yield 18 to 20 cups. You may find better roasting results and control of roast using 3 scoops instead, particularly on the SR300 which does not have variable fan speed. 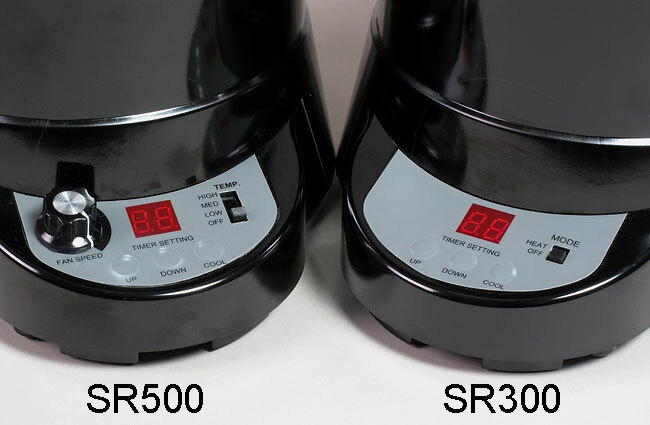 The SR300 is the basic, entry level roaster and priced at $129 it is only slightly more than the Plus 8 it replaces offering considerable value. The SR500 at $179 adds a number of valuable features and makes the higher price warranted in our opinion. It gives you the ability to control both fan speed (plus or minus 10%) and roasting temperature (high, medium, low, off). 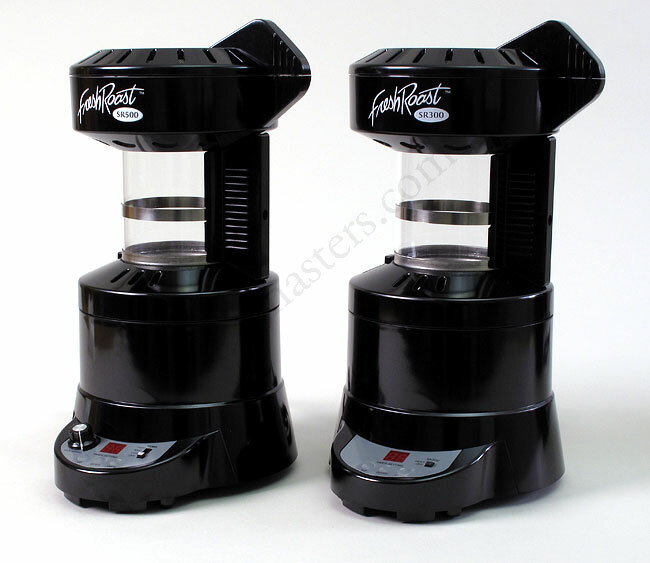 Both models have timers that are preset to 5.9 minutes and you can increase or decrease time as needed. A separate Fan Speed Control has been added that allows fine tuning of the roast. Generally, you would want the highest speed at the start of the roast when beans are heaviest and have yet to lose moisture. This would help keep beans moving. Later in the roast lower speeds would be desirable. In addition to the three buttons Up, Down and Cool are fan speeds Low, Medium, High, and, a variable fan speed control knob. 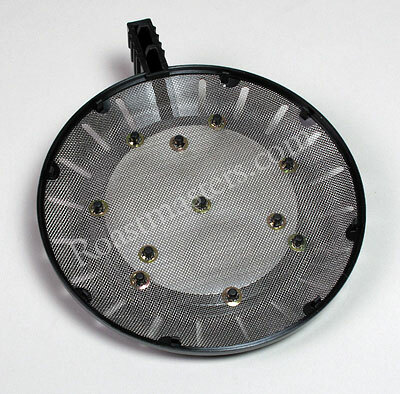 At $179 the Fresh Roast SR500 is priced lower than any other roaster other than its lesser priced mate. The Hearthware iRoast2 is priced about $20 more (by the way it is not in stock as of this writing) and you will find some advantages in Fresh Roast models over the iRoast2, most notably the relative quietness here, providing you with being able to clearly hear the audible cracks that the roasting coffee goes through. The iRoast2 does have programmability absent from either Fresh Roast model, but the roast cycle is quite fast, sometimes too fast, and the majority of home roasters will have a pretty easy time getting repeatability from your roasts without the need to save a program. One of the problems with the original Plus 8, in our opinion, is that it was easy to scorch beans, which happened during the early stages of the roast. The dense beans sat just above the heating element and fan, but the fan wasn't sufficiently powerful to get them airborn. So, they just sat there getting overheated on their underside until they had shed enough water weight to begin moving in the air stream. These new models address the problem but each in a different way. The base fan is more powerful than the Plus 8 so even the SR300, which has no variable speed fan, is equal to the medium speed of the SR500. The heating element is considerably more powerful at 1600 watts than the earlier model's 1100. The ability to regulate fan speed, combined with heat intensity, offers some protection against scorching. With the SR500 you can increase fan speed at the outset to help beans get moving. The manufacturer suggests if beans are particularly dense or high in moisture that you run it with beans in and heat off for a couple of minutes. Likewise, you may want to lower the fan speed toward the end of the roast. The more expensive model gives you more ability to tweak and many roasters will like that. New SR500 (left) compared to the discontinued Plus 8 model. Inside view of lid. Screen captures chaff.